When I first met Ryan in 2012, I was looking for an ice axe. I was not stranded on a crevasse-riddled glacier or bootpacking up a refrozen couloir, but I was lost—in the used gear section of Next Adventure, a gear shop in Portland, Oregon. I’d just moved there from across the country with a splitboard, a wetsuit and a dog, looking to fuse my lust for outdoor adventure with a budding and barely stable writing career. Once we got to talking price, I realized I was not prepared to spend the money on this newfangled implement, unsure of when I’d use it. I told him so. “Oh,” he said. “Then I’ll just demo you one for free.” The next time I came back to get my board waxed, he swept it into the back of the shop and told me to hold my money. “No charge for a fellow splitboarder,” he said. Over the next few months, I quickly infiltrated Portland’s small splitboard community. On volcano missions, I watched Ryan and other Next Adventure employees ride spicy lines on the north side of Mount Hood, moving fast with their lightweight alpine setups. Our clan revered them for sending the biggest lines in the area and I wanted nothing more than to push my own boundaries in the same direction. One morning on a backcountry hut trip, I was up early when Ryan and some guys invited me to go climb an alpine icefall. I jumped at their invitation, despite the soft Nike snowboard boots on my feet and never having ice climbed. Somehow, I was put in charge of cleaning the route. I soon found myself tethered to an unfamiliar ice screw anchor as a whiteout storm rolled in, blasting me with wind and filling the v-thread holes with snow as I scrambled to push the rope through before rappelling down. It was exhilarating: My whole body tensed as I tried not to mess up, but Ryan remained calm, patiently coaching me through each step until I was safely down. The screaming barfies rushed into my virgin forearms, but group high fives and invitations to join them again soon were all I needed to forget the pain. I was surprised to learn that Ryan was only 22 years old. “I don’t really care about age,” he once told me, referring to his choice of companions. At 27, I was still used to being the younger guy in the crowd, but I had a lot to learn from Ryan. I later took a job in California at a snowboarding magazine and Ryan and I began traveling around the country together, hitting snowboard gear tests and splitboard festivals and shredding whatever mountains called us. His photography skills were also budding, so we began to collaborate on magazine stories. Ryan taught me more and more about reading the snowpack and making terrain choices, occasionally adding a rappel into hard-to-reach powder stashes. He later taught me to lead sport climbs and place trad gear, and introduced me to the ways of the Alaska Range in an alpine basecamp perched in the foreground of Denali, where he’s made an annual pilgrimage for five years. I even had my first acid trip experience with Ryan, camped out in a teepee on Colorado’s Red Mountain Pass, splitboarding beneath a full moon in a snowstorm and blasting David Bowie’s album “Honky Dory.” Ryan’s patience was enviable and he shared his knowledge without hesitation. He’s the closest thing I’ve had to a mentor in the mountains and I’ve always been happy to learn from him. Although Ryan and I share the same passions, we arrived at them on very different trajectories. I spent my late teens and early adulthood following a somewhat typical path: attending a four-year college and committing myself to a Division 1 wrestling program while filling kegs with jungle juice for frat parties. I pounced into the workforce by way of unpaid internships that led to desk jobs. It took me a few years of editing other people’s adventure stories before I realized I needed to be out there writing my own. Ryan was a smart nerd who went to space camp, had the highest eighth grade math score in the state of Oregon, and graduated high school a year early before doing a few years of outdoor leadership school at community college and studying film. He worked retail, did some guiding in the Northwest, and eventually got into a seasonal job hanging Christmas lights around Salt Lake City for two fervent months, which sustained his mountain adventures the rest of the year. Despite the disparity of our backgrounds and never living in the same place after Oregon, we still find ourselves together frequently, driving across some snowy expanse, chasing powder and even spicier thrills. Our differences in age and places in life have never been obstacles, but they have created a space for me to lend Ryan some of my own accumulated wisdom, almost like an older brother. I sometimes give him advice on women, taxes, health insurance and how to expedite a replacement passport after misplacing it again days before a Canadian road trip. I continually tee him up to shoot photos for some of my magazine stories and connect him with resources in the snowboard and outdoor industries in addition to the ones he’s cultivated himself. Although Ryan’s passive Northwest demeanor conveniently yields to my aggressive East Coast zeal in a way that’s often complimentary for plan-making, any kind of little brother role gets old quickly for an independent adult. This past spring, we sent it overseas and took our mountain riding ambitions to the next level in Chamonix, France, the birthplace of mountaineering and an extreme skiing proving ground. It was my fifth trip there and Ryan’s first time outside of North America. We scored. In one of the best snow seasons in twenty years, we easily fell in with a network of local and transplant shredders who showed us some of the best runs of our lives. Rappelling into 50-degree couloirs and pinning it onto vast, open glaciers had us just as enamored as the steep, 3,000-foot sustained runs with powder so deep that we had to take deep breaths between each turn. But Ryan soon tired of me constantly leading the way and calling so many shots on where we’d stay, what we’d eat and whom we’d meet for après. Our dynamic stopped working and the communication broke down. He’d had enough of my domineering presence and de facto tour guiding while I became frustrated with his subdued energy levels off the mountain as he stared at Instagram for hours every night, uninterested in two-way conversation. One sunny morning, as we raced the rest of the skiers in the valley to the top of La Flégère resort and dropped off the backside into the Aiguilles Rouges, we eyed up an approach couloir that would take us up and over to the Glacier Mort. Ryan set the skin track up to a convex rib that woomfed under his kick turn. We briefly yelled back and forth about it but decided to hug a rock band and go around the unstable section. There was no check-in about how everyone was feeling. Ryan kept ascending a slope on the same aspect and we were spread out as another group guided by an American approached below. I followed, thinking more about the slope we’d already skirted while rehearsing a conversation in my head that I wanted to have with Ryan to clear the air. Further up, on his farthest left kick turn, Ryan felt another little woomf and didn’t say anything. As soon as I stepped on the same spot, the skin track collapsed beneath my feet and remote-triggered an avalanche on the steep, windloaded slope above me as the whole thing ripped. The avalanche took out my legs and swept me along for an 800-foot ride in a tumbling cloud of white, muffled darkness. I was not buried, just shaken, and I’d lost one of my splitboard skis in the debris. The American guide, who’d also been hit, suffered a hamstring injury but was still able to ski out. Ryan and everyone else present were fine. Everything could have been catastrophically worse. This was nothing if not a soft warning shot. Looking back, the terrain choice we made given that day’s forecasted avalanche stability was not a reckless one, just unlucky. But I was angry. 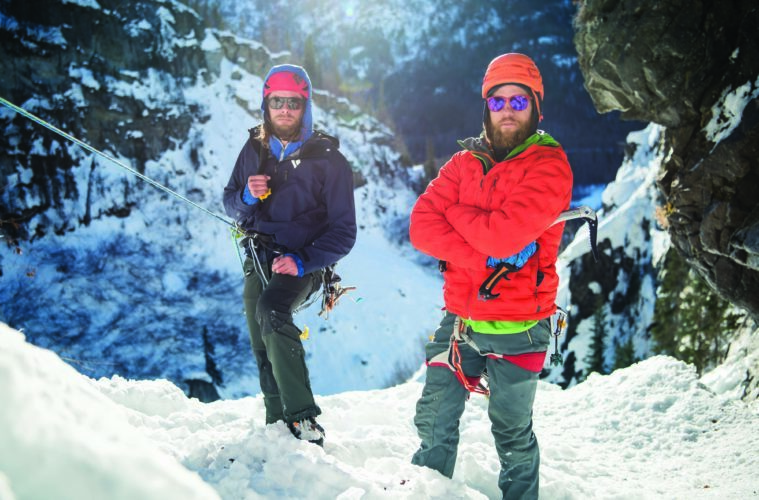 I was angry that it’d happened and angry that Ryan and I had let our communication fall to the wayside, despite that being the most crucial element of a backcountry partner relationship. Talking it out may not have prevented the slide, but the feeling of being caught with our pants down while not in the right frame of mind was embarrassing and infuriating because so many people don’t get a second chance to learn that. It was neither Ryan’s nor my direct fault, but in our debrief after the episode, we both poured out the frustrations we were having with each other and acknowledged how they had trickled into our backcountry dynamic in a dangerous way. We continued to talk and felt tremendous relief at being heard and understood and having a better sense of where we both stood. In a dicey way, the dangerous experience served as the very opportunity we needed to open up and say what needed to be said, which made the rest of our time together a lot more enjoyable. Since then, our relationship has outgrown itself a bit. I’ll still call Ryan for advice on climbing gear and nag him to rehab his injuries. But I don’t look to him to teach me everything, just as he doesn’t look to me for advice so much as genuine support and someone to talk to as an equal peer. We’ve become regular old best buddies—and I still have that first ice axe. The Best of Breck Eat, Sleep, Play: Snowmass, Colorado Joys of the Lone Wolf Dog Days The December Issue is LIVE!